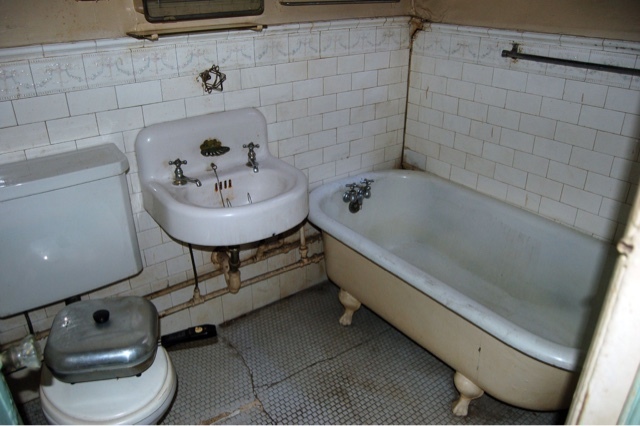 The unloved bathroom - makeover or move on? Unless you have been reading for a long time, you probably have never seen this photo. That's because this is the most unloved room in our house. It's a guest bathroom - the one that got the least amount of money and attention during the gut renovation. I know we are incredibly lucky to have such a luxury as an extra bathroom but when we were at the tail end of the renovation that seemed endless and our pockets felt extra light, I just sort of gave up and did what was good enough at the time. Check out a recap of this room's renovation here. But I would love to give this space a refresh. Specifically paint, new accessories and new lighting. I just need some motivation to get me there because its easy to just sort of let this room languish since it's not offensively ugly - its just bleh. I have guests coming in April - perhaps just the motivation I need? It seems to me you would only need some pop of color in accessories..Maybe new shower curtain, towels, rug? I agree it wouldn't take too much but I really want to change the paint color (I only picked this color b/c we were at the tail end and we already had extra of this color) and the light fixture over the mirror. Easy enough to do though - I just just bite the bullet and get to work. I agree with the ladies. I would take your bath in a heartbeat and it truly is lovely, it just might need so some wonderful new accessories and maybe some trim work along the ceiling, unless you prefer the cleaner lines. As I'm sure you already know, small rooms can often handle really dramatic paint - pick a really bold color! You could even paint the ceiling or do a fun stencil on the walls or ceiling. Another idea would be a fun piece of art for the wall. I can't wait to see what you come up with! Oh my goodness yes do black - love that idea and will make this bathroom really pop. I love everything you did choose in here though! How about a skirt around the sink to soften it some, and maybe a different mirror? Thanks Ivy. I love artwork in the bathroom but unless I sacrifice the only place to put towels, there really isn't any large spot. I could put some tiny pieces somewhere but that won't have the same impact as a large one. You can do a fun gallery wall above the towel rack and to the right... would be a cool focal point with fun frames and art works.. I have a small bathroom with all white tub, sink, tile....you get the idea. I went to the store and bought the brightest boldest blue I could find, I called it superman blue. It turned out wonderful. It didn't make the room small and it always made me happy and was bright even without any windows. Add some crown molding? Lighter paint color (quiet moments, #1563 by Benjamin Moore is stunning in a room with little to no natural light!) Quiet moments can look too pastel in a room with natural light, but with little light it is lovely! Maybe some soft yellow accents? Funny - this is one shade down from Quiet Moments (we have that color in our bedroom and I love it). I just want to get away from the green and the spring color families. I never wanted this bathroom to be green in the first place so I'm going to go as far away from it as possible. I love this bathroom!! Lol! I am actually thinking of re-doing our main bathroom like this! I would love to find a sink like that, hopefully at our city's rehab store! You know you really want to go with something drastic such as black. Do it! Yes to the black! When in doubt always go black (high gloss!). It's never failed me yet. I adore seeing your "before" pics. It's like a NY time capsule....so strangely mesmerizing! I have a similar white wall tile/black and white floor tile situation in our teeny tiny bathroom, and recently painted it black. I style it out with black and white turkish towels and a mostly white fringed shower curtain. I LOVE it. It feels so much cleaner now! Yes to black! Also moving the shower curtain rod next to ceiling will make the space look bigger, but you might have to get custom curtains because of the height. Other possibility is using a regular decorative fabric on the outside of the tub and a liner on the inside, that way you have a lot more to choose from. If you paint it black it must be a flat paint. I like the green. Skirt that sink with a beautiful fabric and embellishments. I'll show it for you if you need help. Upgrade your shower curtain. Beautiful white body sheet towels. Clever art. A good rug. Good quality toiletries. Maybe simple shelving to set down a brush or makeup case. Wow! While yes, you poor, poor girl- it is obvious you have 'neglected' this bathroom compared to rest of your castle, it has such potential! I love the idea of painting it- not pure black, but a very deep charcoal- something like BM Black Panther,Graphite, Wrought Iron, or Kendall Charcoal. And not gloss- any and every wall imperfection will show- eggshell finish for sure. Add gorgeous, ornate crown molding at the ceiling- something stunning- not the typical classic style you probably already have throughout the rest of your home now, something like 'egg and dart'. I think I detect a ceiling fixture now,as well as lighting over the sink? How about a small crystal chandelier or crystal fixture hung close to the ceiling with a ceiling medallion. A bold floral curtain panel on a black background, like this: http://www.sailrite.com/P-Kaufmann-Quiet-Refuge-Onyx-Fabric, hung high, from a short rod hung from the ceiling, one stationary panel on the left side, and stationary one panel on the right side, each tied back with a white fabric shower curtain and liner underneath for practicality. The decorative curtain now becomes your art! Add a crisp white waffle weave skirt to the sink. If possible space-wise/that electrical outlet looks close- change out the medicine cab/mirror to an oval, like the Kensington Pivot Mirror from PB. Not entirely necessary, but you could also hang a white cabinet above the toilet for more hidden storage to make up for the lack of it under the sink. Install a towel rod on the back of the door and hang thick white fluffy "S" monogrammed towels there. Brushed nickel, mercury glass, or apothecary glass accents for soap dispenser, waste basket, etc. on display on th glass shelf you have now. I'm in heaven!... Cant wait to see what you come up with! I love a deep deep turquoise blue. It seems to fit a bath and it's a bit dramatic. I new light fixture would be really nice and then a lush rug. Definitely agree it needs new paint, but I think I'd opt for a deep charcoal over black. What kind of natural light does the room get? Maybe switch out the mirror cabinet for a white hardwood medicine cabinet? That would look gorgeous on a dark background. A less standard-looking light fixture and some new accessories would be the other things I'd do. Good on you for salvaging that sink! Sometimes they're beyond help. great bones... I think you almost have it. 3. loose the metal shelf unit. Who really uses those towels? if necessary use an antique wall cabinet. I think the space needs some wood. 4. loose the modern medicine cabinet. Replace with a single mirror or a mirrored door with frame. I love that you kept the original sink, so (sorry ladies), no "skirt", she looks good naked! My own bathroom is a dark grey, changed out 3 years ago from pale lilac and I love it. The floor is a paler grey and it is towels that give mine the lift (lime green or raspberry pink depending on how I feel! If you like the idea of black, go for it... but as someone else has said, not matt black. Any matt finish shows every mark and even the fact that it's been wiped shows up, but an eggshell finish is easily wipeable. I wonder if, whatever colour you choose, you might consider a high gloss stencil, perhaps a bit rococco, in the same colour - big in size (say a foot or so deep), about a foot down from the ceiling? Just a thought. Whatever you do it will be fab, you have such good taste! I'd do charcoal chalkboard paint, put a cute stool under the sink and a bucket of chalk on some open shelves above the toilet (along with towels, tp, etc) and then enjoy seeing what your guests write or create on the walls. In a bathroom the steam will keep anything from being permanent but it'd be loads of fun while it lasts! I love the bones of the bathroom. I think all it needs is an interesting wall treatment. Maybe wallpaper from Anthropolgie? That and a little built up crown around the top and it'll look amazing! I think it's gorgeous as is, but how about something inspired by the dresser you did with the old map on it? It's one of my favorite of your projects, and I think something along those lines would be very striking. I also like the idea of black/charcoal walls, but the color of that dresser and those old-world maps really call to me! It is amazing how having guest really gets our butts in gear. I actually think the bathroom is charming. I do love the floor. I guess I've been reading for a while because I DO know this bathroom (first found you because I wanted to see bathrooms in the color I had picked for mine, Quiet Moments)! I love the idea of black (or a very dark charcoal). Black paint for sure!!! That was my first thought before you brought it up. White shower curtain and white towels. Super crisp and tailored, just like your house. It will be fabulous. Black for sure!!! That was my first thought before I read your comment. White shower curtain and white towels. So crisp and chic. It will look amazing!! The off-center mirror and light would drive me crazy. Move the electrical outlet and recenter everything first.